Some while ago I happened upon wireless tag net which market a range of simple to use wireless tags for temperature, humidity, movement etc. These devices use short range wireless comms to a wireless node connected to the house broadband router. Once activated the tags can be monitored and controlled via the web. There are a number of extensions to this using other technology devices which all in all make them rather attractive and useful. I decided our house in France would benefit from the use of these devices and this would allow us to monitor the house from the UK. I bought a package of 5 temperature/humidity/movement tags and a single moisture tag for the garden. These are really easy to set up and add to your web portal. Results are graphed for you to see trends etc. Really nice simple and useful product. I could put lots of pictures up but the best thing is to follow the link as above and read all about it. Deliver to the UK was quick but got hit for import duty and VAT. Unusual for me but this is a bit of rant …. but ultimately a helpful one. As we were on a short visit to France we flew out this time on that ‘Irish airline’ from Bristol to Bergerac. To avoid their complex baggage costs we put all the heavy and bulky stuff in box, taped it and strapped it and booked it with DPD to ship to our house in France on their 2 day door to door service. Potentially this would arrive a day after us and we would have some clean underwear. This time it didn’t go so well. The package dimensions and associated weight did not allow drop off to a local store but instead had to be collected by DPD themselves. I booked the consignment at 9am on Tuesday and immediately got a message to say the package would be picked up that day before 5pm. Contacted customer services, apologies, new shipping label issued, pick up tomorrow promised. Strangely enough after the re-booking I received an acknowledgement giving me a pick up time slot which I did not receive after the first booking. Now we were leaving early next day (Wednesday) by the aforementioned Irish airline so we would not be home to hand over the parcel. Customer support pointed out that we did not need to be there for the pickup but we should leave a note on the porch door indicating that the parcel clearly visible inside the porch was the item to be picked up and taken. Without this the courier would not pick up the item even though it had a DPD label clearly in view. It was pointed out that the package would not be insured until collected which is clearly the correct approach. On arrival at Bergerac we received an email to say the package had been picked up, was on its way and would be delivered on Friday. Great news. Now our house is on the edge of a village. We have no house names and no house numbers in the village. French postcodes are totally useless. Their postcodes can cover an area the size of Greater London so the courier is between a rock and hard place. We are somewhat spoiled in the UK where postcodes only cover maybe 10 houses maximum in a very tight local. Given the knowledge that the courier is not going to easily find our house we give a mobile number which appears on the DPD label and as a belt and braces I taped ‘finding our house’ instructions to the outside of the box including the GPS coordinates. You can see where this is going …… Friday morning in France we received an email from Chronopost to say the package will be delivered that day between 11am and midday. I sat patiently waiting until noon when an email arrived saying the driver needed more instructions …. follow the link and give more details. The link box provided allowed 70 characters. Ever tried fitting instructions into 70 characters when Rocamadour is one of the words ? Gave up and just wrote along the lines of ‘the instructions are on the box for all to read and so is the telephone number. Read and use please’. Reply comes back – package will be delivered on Saturday between 8 and 12. Package did not arrive on Saturday …. contacted DPD via their interactive web dialogue. Lots of apologies, Chronopost need more instructions etc. Told DPD to tell Chronopost to forget it, I would go to the depot on Monday and collect it. Monday morning at 8 am email arrives from Chronopost to say the parcel will be delivered that day between 11 and noon. I now had the local depot contact details so I rang them and asked if they really meant it. They said they had instructions on the parcel on how to find us. Revelation indeed. And yes the package arrived at 11.30 am on Monday. The two day service via DPD to France had taken 6 days including the weekend. The conclusion to all this is that I suggest if you send a parcel from UK to France, perhaps with DPD, then when booking in the shipment, in the Company name field, put in capital letters and brackets ( ITINÉRAIRE À CHEZ NOUS SUR LA BOÎTE). This will appear on the courier address label and will also appear in their master routing manifest. If you have a French phone number use this rather than a UK mobile. They do not seem to like ringing a +44 number judging it to be a potential franglais session or just too difficult or not allowed. Then on a separate label, in French (use Google Translate as a starter) and in large bold print, detail exactly how to find your house and stick it to the box. If you think it might help add a picture as appropriate and also add the GPS coords. This should give them zero room for wriggle and you might get your package in the promised 2 days …. but remember that as ever in France …. ‘demain’ rules. 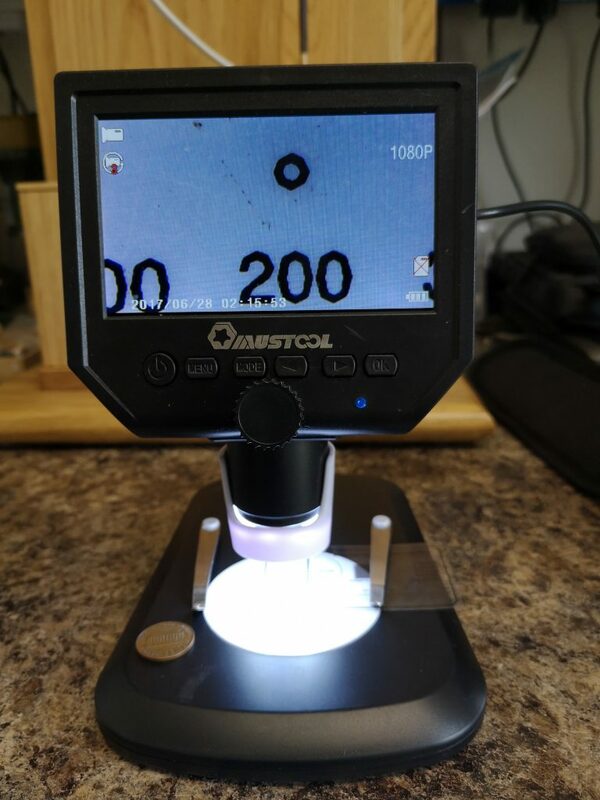 I had previously posted about the low cost HD microscope that I had bought to see if was any good. For the price I was impressed by the microscope but not by the stand that came with it. It only needed to be breathed on to wobble and the fixing was poor. While browsing Amazon I spotted a more conventional looking stand for sale. This was sold as being aluminium but when it arrived this morning this was a bit creative being mostly plastic. 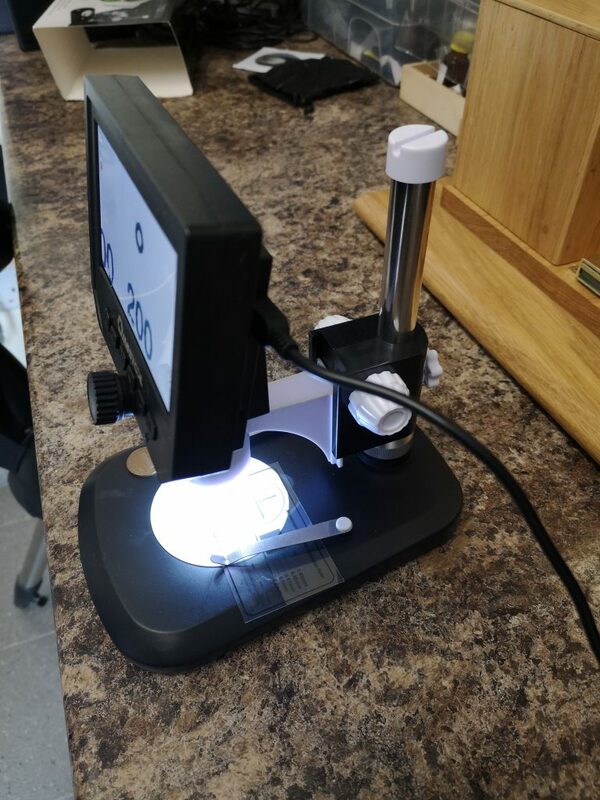 However the microscope fits into the cup holder mounting and it makes a dramatic difference to the stability and therefore the usability of the microscope. You can preset the height with a knob on the rear and then there is a rack knob to move the scope up and down. You can focus using the microscope control or on the stand rack knob. It is now a stable device to use and for the price of the microscope and the stand it is a useful addition to the tools available. The stand comes with a calibration sheet to allow you get a feel for the magnification factor. The picture below is displaying a 200um circle.